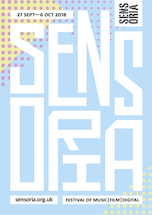 The Sensoria Festival Ltd is a not-for-profit company Limited by Guarantee. Our aims are to help promote cultural activity within and beyond Sheffield. Company Limited by Guarantee no: 6644266. By opting in to our emailing list to receive updates on our programme plus related news items, you will often be the first to hear when our tickets go on sale. Your data will be held on our mailchimp* list. You can unsubscribe to the email list at any time (there is an unsubscribe button at the bottom of our bulletins). When purchasing festival tickets your data is held on Eventbrite*. We take enough information (name, address, email address, telephone number) to ensure we can contact you regarding the event if necessary. Following the event your details will be deleted within 3 months. We do not pass on your details to 3rd parties other than the IT providers named above. *Please check the IT provider’s policy for more information. This notice is dated 24 May 2018. We review this notice regularly as part of our internal processes or as our services, activities, or processes change. It is subject to change at any time. You have the right to be informed about how and why we process your personal information including why we need it and how we will use it. You can find most of the information you need in this Privacy Notice. You can request a copy of information we hold about you at any time. You may choose to exercise your right of access through any of our contact channels, but we may ask you to provide documented evidence of your identity before we process your request. We may also contact you to clarify your request or to ensure we have all the information we need to fully meet your request. You’ll receive a full response as soon as we can reasonably provide one and we aim to resolve all subject access requests within 30 calendar days from confirming your identity. In more complex cases where we cannot provide a full substantive response within that time frame, we will write to you within 30 calendar days to explain why an extension is needed. We don’t charge for subject access requests. If you believe information we hold about you to be inaccurate or incomplete, you can ask us to correct it or complete it at any time, through any of our contact channels. Wherever possible, we will correct inaccurate or incomplete information immediately. In more complex cases we will take reasonable steps to confirm the accuracy of the information we hold. Whilst we investigate the accuracy of the information, we will restrict the processing of the information in question. Any information we can verify as inaccurate will be corrected within one month of receiving your request. In most cases you can simply unsubscribe from our e-newsletter. In some circumstances you have the right to ask us to delete information we hold about you. For example, if we have asked for your consent to process the information, and you withdraw that consent. We will respond to your request as soon as we can, and we will act on any requests granted within one month of your request. We can’t delete some information where we have a legal or regulatory obligation to keep it. We may also refuse your request if we believe it to be excessive. If your request for deletion is refused, we will explain the reasons for refusal. In some instances, you have the right to ask us to restrict the use of your personal information (for example if you have challenged the accuracy of the information we hold or have objected to our processing). We will restrict our use of your information whilst we investigate your objection or request to correct your information. We will respond to your request as soon as we can, and we will act on any requests within one month of your request. If your objection is unsuccessful, we will only continue processing once we’ve let you know the outcome of the investigation. When processing is restricted, we are still permitted to store your personal data, but not use it. Information related to these requests will not be automatically deleted unless you expressly ask us to. We take complaints concerning your privacy very seriously. If you think our collection or use of your personal information is unfair, misleading or inappropriate please bring it to our attention and we will be happy to provide any additional information.. We also welcome suggestions for improving our procedures. You can also contact the Information Commissioner’s Office at www.ico.org.uk or write to Wycliffe House Water Lane, Wilmslow, Cheshire SK9 5AF or 0303 123 1113 for information, advice or to make a complaint. the processing is necessary for us to comply with the law. To provide our services to you, we need to collect, process and store information about you. We use your information to administer, support, improve and develop our business generally, to provide statistical information to meet our lawful requirements and to enforce our legal rights. If we intend to use your information for a different purpose, we will do so in ways consistent with Privacy Law or, wherever possible, by notifying you in advance. We will only use your information for the specific purpose(s) for which it has been provided to or collected. We collect and process a variety of information from you and about you. In most cases, the information we collect about you is provided by you directly. This helps us to confirm the information we collect is accurate and as up to date as possible. We will only collect sensitive personal information about you with your explicit consent, and for a specified purpose which will be explained to you at the time. If you use our website, we will keep a record of the contact and we may collect additional information about you to provide a better digital service and website functionality. More detailed information on what we collect in different circumstances and how it will be used is set out below to ‘what to expect when you contact us’. We prefer to collect information about you directly. This helps us to confirm the information we collect is accurate and as up to date as possible. We also work closely with trusted partners (including, for example, technical, payment and delivery services, advertising networks, analytics providers, search information providers, and debt collection agencies) and may, on rare occasions, receive information about you from them. If you contact us by phone or in writing (including e-mail, live chat, social media or via our website) we will record, monitor or keep copies of the correspondence. When you contact us by telephone, your telephone number may be added to our records so that we can contact you in future to provide further information. This information would be held on mac computers that are secure and password protected to the best of our knowledge and ability. We strongly advise not to post your personal contact or other sensitive information on a public social media site. If you contact us using social media to report an issue, we will ask you to private message us to gather suitable information. We may suggest an alternative contact method if we think this is more appropriate. If you make a complaint to us, we will follow our complaints process. We may need to share details about your complaint internally to fully investigate. If you escalate your complaint to the Information Commissioners Office, we may share information with them in order to resolve your complaint. If the complaint relates to a service provided by a third party, we will share information with them to resolve your complaint. If a complainant doesn’t want information identifying him or her to be disclosed, we will try to respect that. However, it may not be possible to handle a complaint on an anonymous basis. We will only use the personal information we collect to process the complaint and to examine the level of service we provide. We may compile and publish statistics showing information (for example the number of complaints we receive), but not in a form which identifies any individuals. We will keep complaints in line with our data retention policy. This means that information relating to a complaint will be retained for seven years from closure. We use information gathered through cookies and similar technologies to measure and analyse information on visits to our websites, to tailor the websites to make them better for visitors and to improve technical performance (see below for more information). We will not use the data to identify you personally or to make any decisions about you. Our website may also contain links to and from other websites including our partner networks and affiliates. If you follow a link to any of these websites, please note that we do not have control over these websites or their content. These websites have their own privacy policies and we will not accept any responsibility or liability for you visiting these. We recommend that you review the website terms and conditions that are applicable to the third-party website. In most circumstances we will not disclose your personal information without your consent. However, there are circumstances where we need to share some of your information to meet our compliance obligations or where we are permitted to under Privacy Law. We have legal obligations to share data with some third parties identified in law. We may disclose your personal information to third parties if we are under a duty to disclose or share your personal information to comply with any legal obligation. We do not require your consent to process your information in this way. We use trusted partners to help us process your personal information and provide services to you. · third-party IT and software providers for different systems, like our email management, ticketing management systems. Our current suppliers are mailchimp and eventbrite. Our website is developed by 10th Planet. There is a link to our Cookies policy on the website. · companies to help us process payments including card payments (paypal). · From time to time we require legal advice and may need to share your personal data with our legal advisers to obtain advice or make a claim. We only keep your information for as long as we need it. We will retain certain information eg phone number and email address in the run up to and during our events. Once our events are over we will delete your details within three months unless you opt-in to our lists to hear from us again about relevant events. · Third party systems (ie ticketing and email) may retain your information and their privacy policies can be found on their own sites (eg Eventbrite and mailchimp). These retention periods may be extended in certain limited cases as prescribed or permitted by law – i.e. because of an accident at one of our events or to bring or defend a legal claim. Our opt-in email list is stored on mailchimp, a trusted 3rd party (Name and email address). Ticket information is stored on eventbrite. Paye staff (2 senior staff and 1 p/t) have access to the information. Our employees all receive data protection awareness training. We collect information from our volunteers and staff and candidates on laptop devices and delete the information once the contract is complete or the recruitment decision is made. Where we transfer information to third parties to enable them to process it on our behalf (see the information about Trusted Partners above), we ensure that the providers meet or exceed the relevant legal or regulatory requirements for transferring data to them and keeping it secure. Unfortunately, the transmission of information via the internet isn’t completely secure. Although we will do our best to protect your personal information, we cannot guarantee the security of information you send to us that is outside of our security arrangements; any transmission is at your own risk. Our Sheffield Music Map app was developed and is managed by the HRI at The University of Sheffield. If you’d like to hear from us regarding a specific topic, please sign-up via the below links. Our general newsletter including show announcements and programming updates. Information relating to our Pro event and industry news. Information about our annual Synthfest event. Data on this list is joint-controlled by Sensoria & Sound On Sound Magazine and you may be contacted by both parties. The UK's Festival of Music, Film and Digital Media.